Have you ever seen one of those dishes that you look at the ingredients and think they could never possibly work together? That was me with this dish. We southerners tend to really love Pimento Cheese, and we like the kick of buffalo sauce every now and then (mostly on our chicken), but we like those things separate. Don’t go messin’ up a good thing of pimento cheese, now! Well….I’m sorry. Actually, I’m not sorry, cuz this dip is DELICIOUS! It’s a little more than delicious, y’all. This dip is downright sinful! While there’s nothing in it that’s good for you (try not to indulge TOO hard), every bit of it is good for the soul. At least, that’s what I’m telling myself. It’s comfort food at it’s finest. It’s basically a party in a bowl, and everyone will want an invite. When I make this dish, it’s best that I make it for an event where several will partake. Otherwise, my husband and I will sit down and eat this thing in 3 servings. Not that that’s happened. It might have happened a few times, though. Just sayin’. In a large bowl, combine all ingredients. Blend well. Top with additional cheese if desired. Pour ingredients into a casserole dish (8×11 or larger) and bake uncovered for 20-25 minutes. 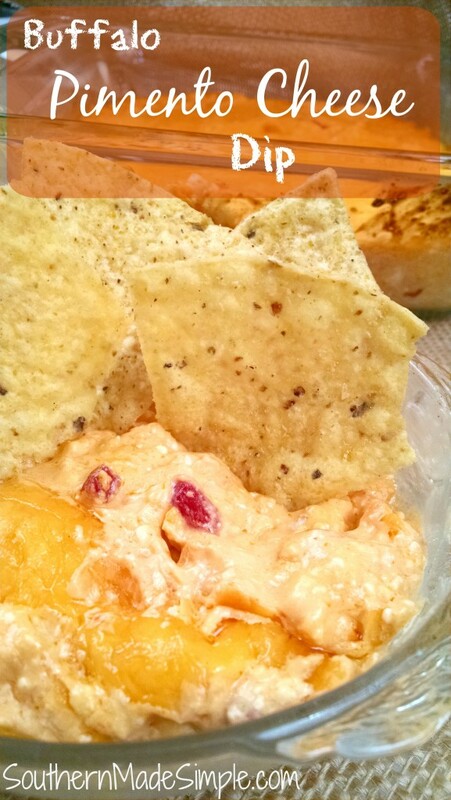 Serve with tortilla chips or your favorite crackers. I love Ritz Crackers with this!